It is important for real estate investors to know how Land Trusts and “Subject-To” agreements work together in their transactions. Joe will be able to spend time covering more advanced aspects by integrating these two topics. 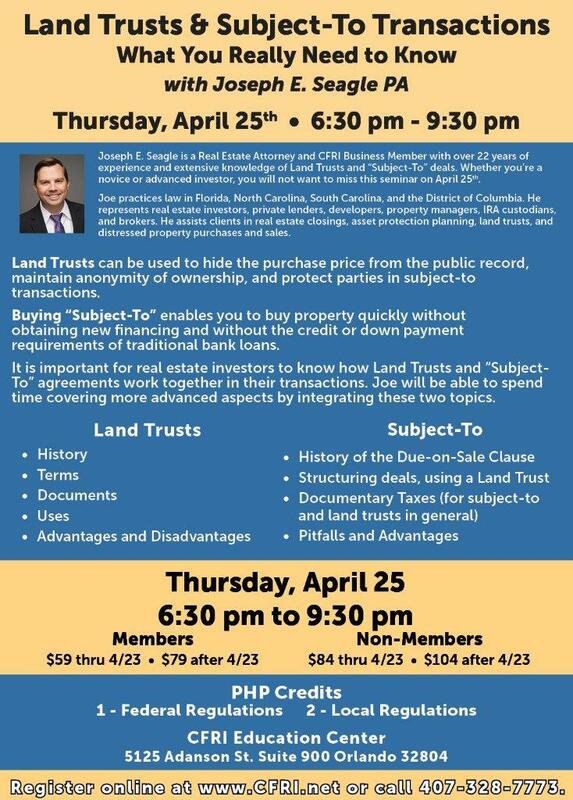 Land Trusts can be used to hide the purchase price from the public record, maintain anonymity of ownership, and protect parties in subject-to transactions. Buying “Subject-To” enables you to buy property quickly without obtaining new financing and without the credit or down payment requirements of traditional bank loans. It is important for real estate investors to know how Land Trusts and “Subject-To” agreements work together in their transactions. Joe will be able to spend time covering more advanced aspects by integrating these two topics. Joseph E. Seagle is a Real Estate Attorney and CFRI Business Member with over 22 years of experience and extensive knowledge of Land Trusts and “Subject-To” deals. Whether you’re a novice or advanced investor, you will not want to miss this seminar on April 25th.